At last weekend's CCPS AGM, the membership debated our Society's long-standing Conflict of Interest Policy. The impetus for this was the discovery of three tapes in the box which Ian Doig had lent us. We previously had these tapes in the CCPS collection, but were unable to post them due to the above-mentioned policy. But, as a result of a lively (read: bloody and ferocious) debate and the subsequent discovery of a little-know sub clause of the policy which, had we known about it earlier, could have saved us from at least two broken fingers and a bloody nose. 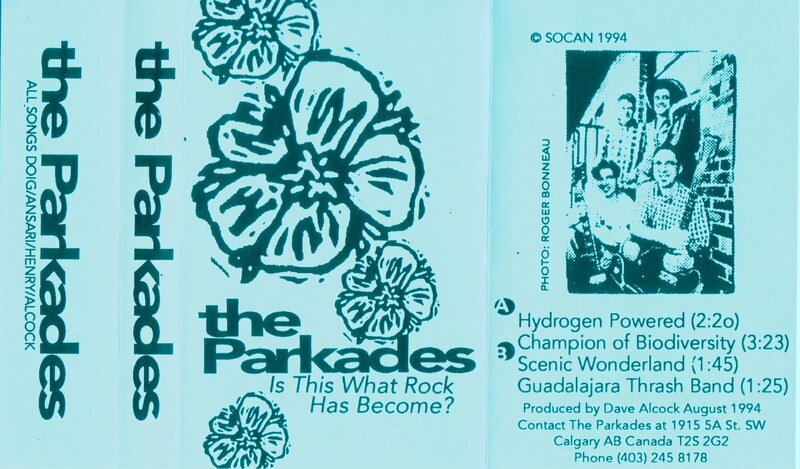 Anyways, process talk aside, we're now very pleased to present the first of three tapes from the Parkades. Please note that, although this text was prepared by an unbiased third party in accordance with CCPS policy, Gene Poole has - as Founding Member, Chair and El Presidente for Life - final editing rights on all CCPS posts and may choose to exercise his rights as established in the CCPS Founding Charter. Apparently we weren't finished with the process talk - we believe we are now. We're surprised to hear that the Parkades were highly-unloved during their time, which strikes us as odd due to their inclusion as the inaugural Rotoflex single. Ian notes that, although this was recorded by Young Dave Alcock in the basement of a house in Cliff Bungalow and released in 1994, it actually followed recording of the much-heralded Rotoflex single. As a fluke of timing, the band put this tape out first after Dave Neufeld left the band and was replaced by Alcock. And if you believe that, you can the Parkades' four-song tape here.